The Apple Picking party is so popular that we have dedicated this entire section to Apple Picking birthday party ideas. Read through the Apple Picking party ideas and incorporate the best birthday party ideas into your party. Create your own party plan and remember to include invitations, decorations, games, activities, party food, beverages, party cake, party snacks, gift bag favors, costumes and gifts. 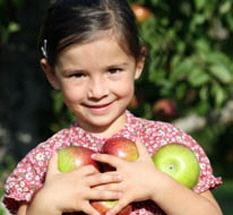 Have a super Apple Picking party! Apple Party - 5yr - Apples to Apples Game! Autumn Apples Party - 1yr - Hayride! Apple Picking - Corn Maze Magical Fun!